Services are provided seven days per week, twenty-four hours per day. We also have evening and weekend coverage, as well as an after-business-hours answering service to handle inquiries and emergencies. 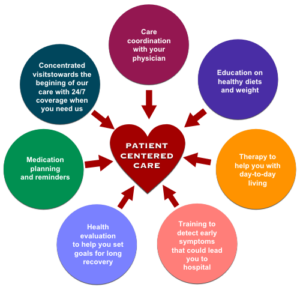 All of these services are coordinated with the physician and the client and administered at home. We specialize in CHF monitoring and teaching. We also provide assistance in obtaining medical equipment and supplies, nutritional guidance, laboratory and respiratory services. All care provided must conform to current standards of practice for the respective discipline and should be reasonable and necessary to the treatment of a medical or psychiatric disorder.